are NOT deleted automatically anymore. That is: for each press of F5 I have about 10MB on my Disk now. Now I can count how often per day I have compiled the Project, thats just funny. Does anybody else can confirm this behaviour? If yes maybe the ReSharper-Team should look at it. ReSharper-Team should look at it. This happened to me as well - I discovered after a week that I had 15GB used in that folder. I've tried to find a setting in re-sharper > options to resolve this but no luck. 1. Is there any 'fix' planned for this in RS4.5? 2. A wanted feature, in similar line to this, would be able to manually set the RS solution cache folder path and the path to use for temp files while performing a full solution analysis (currently it uses the User-TEMP environment variable usually set to '%USERPROFILE%\Local Settings\Temp'). 3. Actually, can I safely delete ALL these "[...]" folders while I'm using VS and RS after a build? 4. What do these RS temp folders do anyway?? edited: resonantworks - added questions 3+4. Can you have a look at what's going on in "User Temp" folder (%USERPROFILE%\Local Settings\Temp)? I've run out of disk space many times with RS4.1 and RS4.5 due to the same issue as the asp.net temp, but I can't work out which folders to delete as a lot of them are locked and named randomly. 3. Open your solution and start working. Are thee updates in the 4.1 nightly builds or the 4.5 nghtly builds? Please find attached a series of step by step snapshots of my local user temp folder after each action performed in visual studio. Nothing else was running except a single instance of visual studio at all times. I've had to replace the client's name and product name with '***' and '$$$$' to protect the innocent The logs were generated by CCleaner. As you can see the temp grew from 0Mb to over 1Gb in a matter of a few rebuilds within a half hour. The same actions with RS disabled produce no temp files, so all these files generated in temp are definitely the result of having RS enabled. RS 4.5.1153.0 is installed. I tried the newer builds on the weekend but they are too fragile for daily work, 1153 is still the best for me so far. Great stuff! Can you say which build/date is scheduled to include these two fixes? 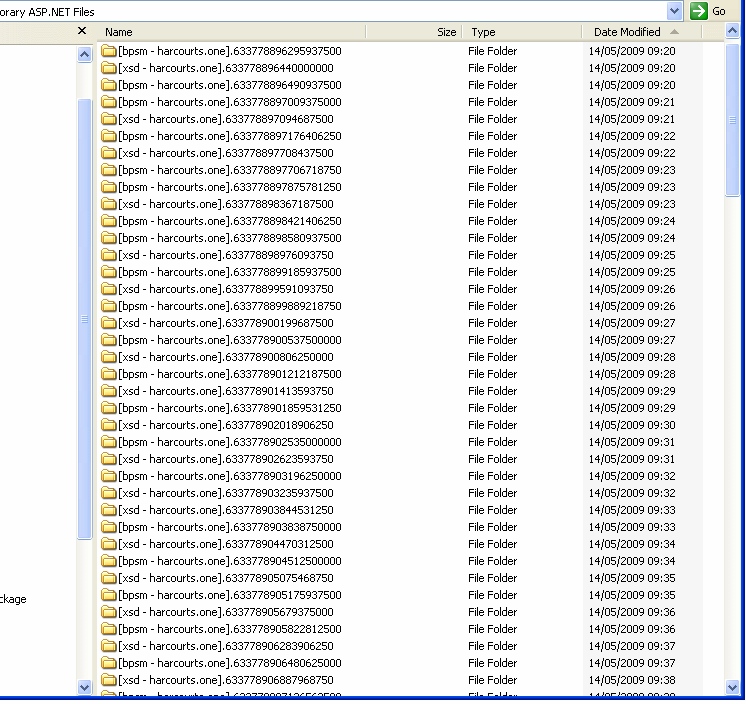 There's one or two [bspm*] & [xsd*] directories created every minute - see screen shot of temp folder. What exactly your temp folder is? Could you send us your website for investigation? My temp folder is "C:\WINDOWS\Microsoft.NET\Framework\v2.0.50727\Temporary ASP.NET Files" running on Windows XP. The VS solution is massive (60MB and Intelectual Property that I'm unable to post to a forum). Weird. Is the floder cleaned up on VS closed? Could you send us a website for investogation?